WASHINGTON—Today the House passed the FIRST STEP Act with overwhelming bipartisan support, sending the bill to the Senate. Introduced by Reps. Doug Collins (R-Ga.) and Hakeem Jeffries (D-N.Y.), the prison reform bill, which also has the support of President Donald Trump, would lower recidivism and prison populations through rehabilitative programing. “The FIRST STEP Act passed today by the House will give incarcerated inmates in the federal prison system a better opportunity to change their lives. “Rep. 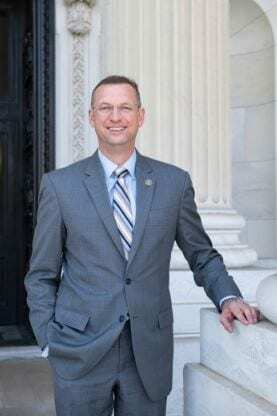 Doug Collins (GA-9) has demonstrated that he is committed to finding consensus for conservative solutions to major problems. Rep. Collins has led the way once again with a prison reform bill that will protect public safety while helping inmates earn a second chance at life,” said House Majority Leader Kevin McCarthy (R-Calif.). “This afternoon, my colleagues seized the opportunity to help men, women and their communities through federal prison reform. Today’s vote puts redemption back on the table for individuals who are committed to building brighter futures for themselves and their loved ones. Today’s vote recognizes the value of every person and responds with proven resources and restorative justice. Finally, today’s vote answers a question in the House and asks one of the Senate: Given the chance to accomplish good in this moment, will you act today or regret your inaction tomorrow? “I also want to thank Congressman Hakeem Jeffries, who has been a friend and partner in this endeavor and an exceptional ambassador for the faces woven into this bill,” said Collins. “This is a victory for all Americans who believe in justice and the importance of second chances. This bill will provide the counseling, education, vocational services and access to hope and opportunity needed to help recently-released citizens get back on their feet and become productive members of society. The FIRST STEP Act is not the end. It’s not even the beginning of the end. It’s simply the end of the beginning on a journey to eradicating our mass incarceration epidemic in America. Congressman Collins should be commended for his stalwart support and leadership in this critical effort,” said Jeffries. Prison reform initiatives have demonstrated success in state systems, including Georgia’s, and the FIRST STEP Act would enable the Bureau of Prisons (BOP) to capitalize on similar resources at the federal level. The legislation would direct the BOP to conduct risk- and needs-assessments for every offender upon sentencing, and then to offer individualized, evidence-based recidivism reduction plans to all inmates. Programs could include vocational training, educational support, substance abuse treatment, mental health care, anger-management courses, faith-based initiatives or other resources proven to lower the chance that men and women reoffend. Additional provisions of the bill would require that prisoners be placed in facilities located nearer their families, prohibit female inmates from being shackled during child birth and provide individuals leaving custody with identification documents that are often pre-requisites for employment.